We've now been in the UAE FOR 6 weeks and in our own apartment for a month. It has been an exhausting and emotional few weeks but I feel like we are starting to make some real headway on getting settled now and about figuring out our new life. 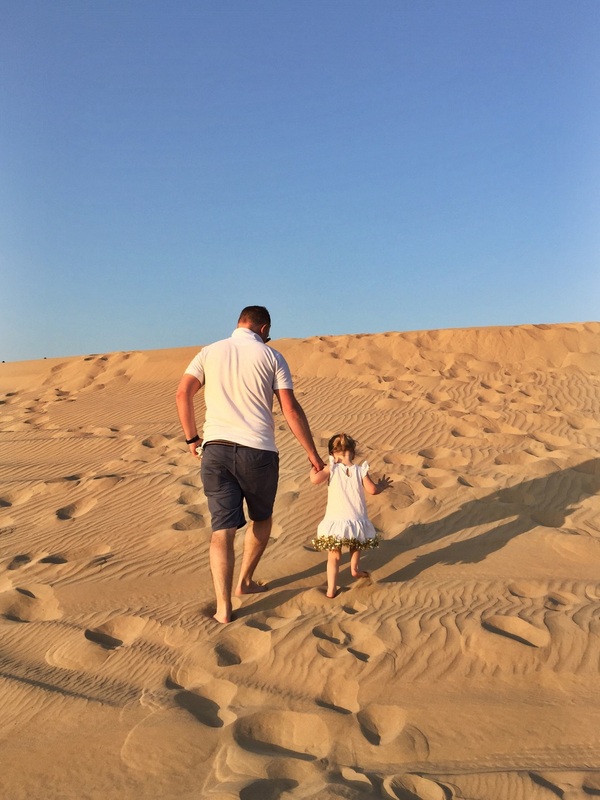 Before we left London I had convinced myself (either through naivety or out of necessity) that life wasn't going to be too different in Abu Dhabi, and that it would be just a little warmer. I hadn't properly prepared myself for how disruptive the move would be, and whilst it worked well to just focus on Madeleine and on one thing at a time, it has also meant being a little shell-shocked for these early weeks. Abu Dhabi is a fascinating place. Being the capital of the UAE means that it a very well established modern city. And yet some thing's are totally old school and never mind Middle East, they are Far Out! There have been some experiences that surely only happen in the UAE, such as going off-road and having an hour round trip, all for the pleasure of getting petrol. Road signs (and speeds) are merely suggestions so driving with a little bottle of Xanax in the glove box might be what's needed to get me through the complete craziness that is driving in the Midde East. And Thursdays are Fridays, and Fridays are Sundays but Saturdays are Saturdays. In normal words the weekends are Friday and Saturday, which is taking some getting used to, Sundays are just a very peculiar day now knowing that the rest of the world is resting while our week is just getting started. There are many challenging aspects to relocating half way around the world, but I am choosing to focus on the positives and of finding the beauty amongst the sand. 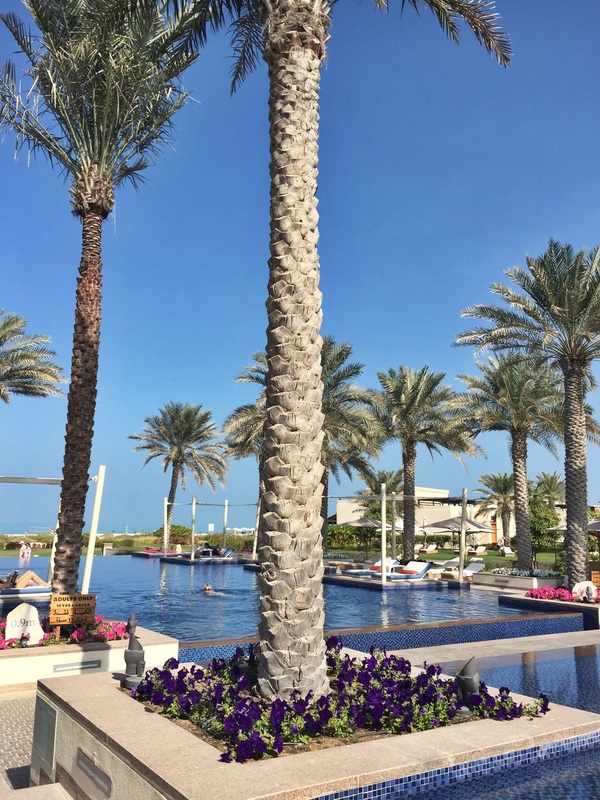 This is the beautiful pool area of the Park Hyatt hotel on Saadiyat Island where we had breakfast the first weekend we were here. The area we live in is a little way out of the CBD and is largely an expat community. There aren't many Emirati's living in our community and so it is a very relaxed and casual expat life. We have a great apartment (that is practically a palace compared to our teeny tiny shoebox in London!!) that has enough space for visitors (hint hint come visit) and my own meg-made studio, to create, dream and just be. We are quickly meeting other like-minded Aussie/Kiwi/Americans with like-scooter-minded toddlers on our way to the pool, gym and beach, which are all fabulously located within 5 minutes walk from us. This is our beach at Al Zeina. However now you will always find a yellow striped umbrella on this stretch of sand, and under sits three of the palest Aussies who are trying to shed their 4 year stint of pale UK skin to return to our bronzed Aussie status! 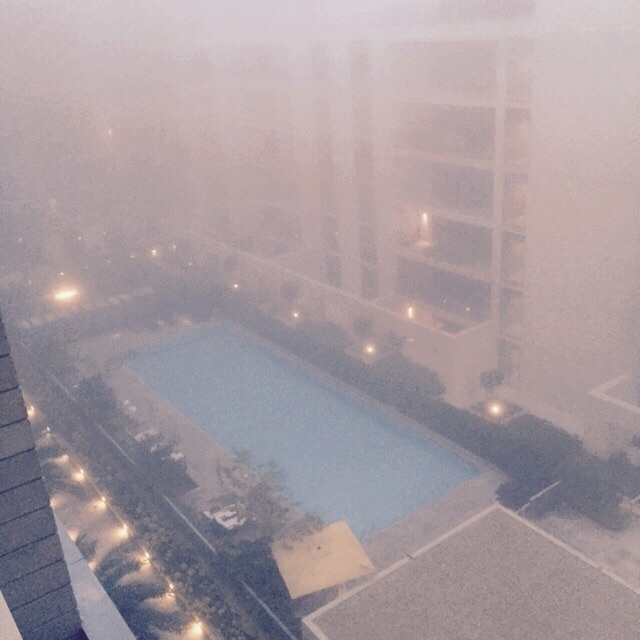 The weather. There actually IS weather here! Moving from the UK where discussing the weather is a National pastime, we didn't expect many conversations about whether it was partly sunny or partly cloudy. But we have been pleasantly surprised by the amount of weather conditions that have come our way. There have been cloudy days and even rainy days. There's even been torrential downpours, which, this country isn't exactly built to handle, so cases quite the dramas when it does happen. Maddie has even worn a vest and jeans to nursery these past few days, oh the shame if her little London friends should see her! We are heading out to the desert this weekend for some oasis time, and I'm thinking its going to be some pretty unique scenery, so follow our journey on IG if you so choose! Now that we have a lot of the administrative tasks and primary setting up completed, we are feeling a little more carefree to explore this crazy town! OH and, I finally got some stock back in my Etsy store this week, be sure to pop by and check out all my pretty new balloons. I hope you have a lovely weekend!! And THIS was our sunset tonight. No filters, no changes, just mother nature doing her very best.